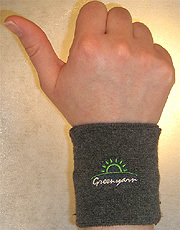 Greenyarn introduces several health / fitness related products, containing a high percentage of our trademark Eco-fabric. It is anti-bacterial, anti-fungal, deodorizing, absorbs and emits far-infrared radiation, thermal regulating, prevents static build up. Far infrared radiation can improve blood circulation and help metabolism. Featuring fine gauge 200 needle count stitching, these products have towel like comfort that absorb and disperses sweat fast.